You shouldn’t have any spelling errors because the user didn’t type the response. The user knows all the answers available because they’re listed. User responses can be mapped to more complex values — for example, you can show the user Red and have the list box return the hex value #FF0000. The select object’s default behavior is to provide a drop-down list. The first element on the list is displayed, but when the user clicks the list, the other options appear. A select object that the code refers to should have an id field. The other element in the form is a button. 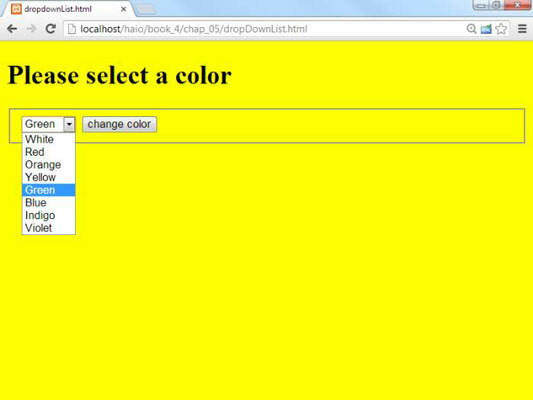 When the user clicks the button, the changeColor()function is triggered. The event handler causes the changeColor() function to be triggered as soon as the user changes the select object’s value. Typically, you’ll forego the user clicking a button only when the select is the only element in the form. If the form includes several elements, processing doesn’t usually happen until the user signals she’s ready by clicking a button. Create a variable to represent the select object. The document.getElementById() trick works here just like it does for text fields. Extract the value property of the select object. The value property of the select object reflects the value of the currently selected option. So, if the user has chosen Yellow, the value of selColor is “#FFFF00”. Set the document’s background color. Use the DOM mechanism to set the body’s background color to the chosen value.